Help Mia get her organic food truck open and ready for business! Park in Heartlake City Square, get set up and then open the side of the truck to make your first sale. Use some of your fresh fruits and veggies to make a delicious smoothie for your first customer. Ring it up on the cash register and give them their change before you serve the next hungry customer. Just make sure Twister doesn't eat all the carrots! Price is 30% below the initial Lego retail price, a € 5.99 discount! This comes down to 12.17 cent per brick. 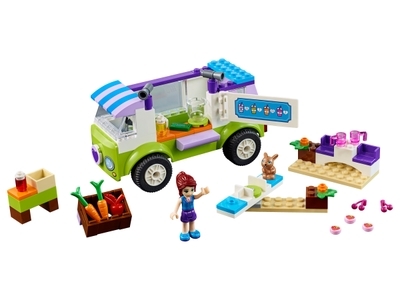 The Mia's Organic Food Market (10749) Lego set is available from the sites below. However, they do not offer delivery to your selected region. The Mia's Organic Food Market (10749) Lego set is no longer directly available from the sites below. However, 3rd party partners of these sites might still have the set available. Alternate description Pick up some tasty organic goodies from Mia and Twister!